Nestled just off Boston’s all you can eat buffet of fashion, Newberry Street, lays an absolute gem. To unknowing passers by, this boutique, would be passed off simply as a rundown Chinese grocery store. 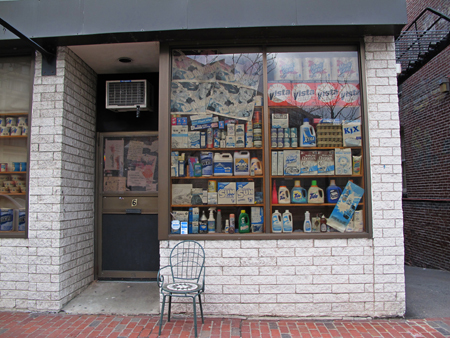 The real heart of Bodega is hidden behind the façade of this run of the mill shop front. You head through the front sliding doors to find a couple Britney Spears sized bouncers sitting at a table playing on their laptops eating fried chicken. You then head to the back of the store to find the face of a vending machine, which doubles as a secret sliding door. The mystery door opens to reveal brilliantly polished floorboards with kicks galore lined up on wooden shelving that looks as if stolen from a Harvard professor’s office. With a wide range of products at varying prices the store is far from a novelty. Bodega also stocks apparel including killer Japanese Head Porter Plus jackets, some unique collaborations, such as Adidas X Bodega, a range of shades, caps and much more.